The new mill installed at Kirov, which is one of the most advanced in the world, will guarantee the highest quality of rolled copper strip for Russian producer OCM. Besides breakdown rolling to prepare incoming material for the downstream finishing mill, the design is as well focused on direct production of high-quality finished strip to the market. Relevant special design features are flatness measurement and control, a special strip drying system for the finishing pass, and a belt wrapper to coil the finished strip to spools. 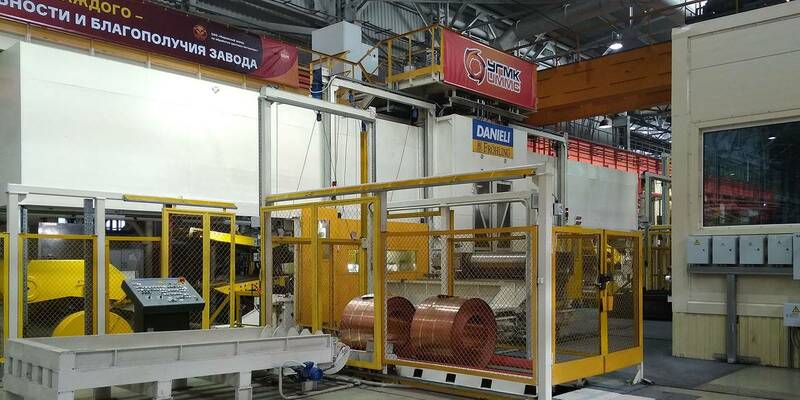 Together with the finishing rolling mill installed in 2008, OCM will be able now to perform the complete copper cold-rolling process from a maximum incoming strip thickness of 16 mm down to foil finished products of minimum 0.025 mm on Danieli Fröhling market-leading rolling technology. Thanks to the new investment the domestic market share of OCM is expected to increase up to 55%. The “start button” launching the new production line was pushed by local region governor Igor Vasiliev, together with the management of UMMC-OMC and Danieli Fröhling.